The secret to an Old Fashioned is a big bourbon with a flavour that can stand up and be counted, because after you’ve added sugar, bitters, ice and an orange twist to engage the senses, the bourbon still needs to sing. Wild Turkey 101 fits the bill perfectly as it’s a classic American, high-proof bourbon – big on age, big on flavour, with a high rye content giving it a bold and spicy character. After mastering your new found skills, you'll sit down to a well-deserved feast. Expect moist meat and crispy skin of smoked beer-can chicken, succulent smoked St Louis pork ribs and a slow-cooked brisket slider that will melt in your mouth. Plus sides guaranteed to deliver – from the big, rich punch of mutton barbecue pinto beans, to the citrus hit of pickled red cabbage slaw. To ensure that all these flavours are perfectly paired, there’s a choice of cocktails, all using Wild Turkey 101: Dixie Fizz, Paper Plane and, naturally the Wild Turkey 101 Old Fashioned. 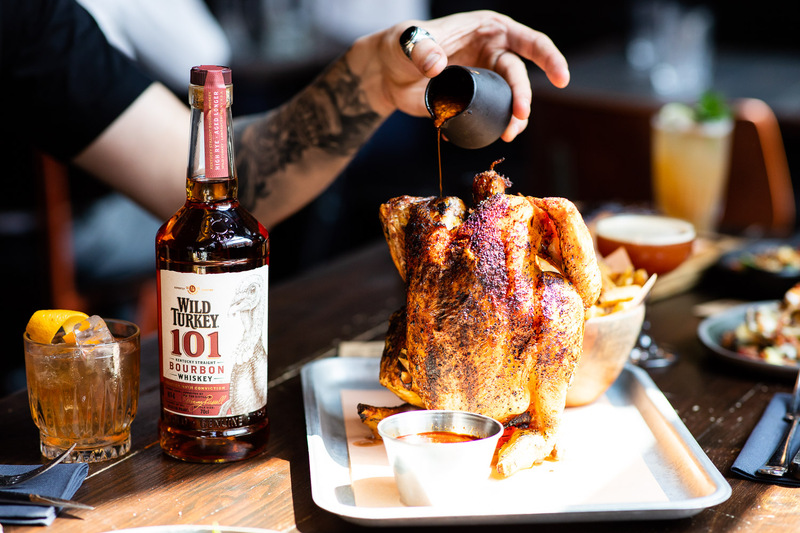 Delicious food and good friends make the perfect moment to enjoy a Wild Turkey 101 Old Fashioned – and with these new skills, it’s a moment you can relive all summer long.